The process of arranging different and diverse elements in a way that shows sense, emotion or intellect, commonly referred to as art has been practiced since time immemorial. There are three classifications of art, namely, architecture, sculpture, and painting. Other sub-classifications include music, dance, film, and theatre. The process of using color, paint or pigment to a surface is referred to as painting. It is an important visual art and can be narrative, symbolic, photographic or even emotive. Surfaces that may be used for painting include glass, wood, walls, paper, copper, concrete and even canvas, just to mention a few. 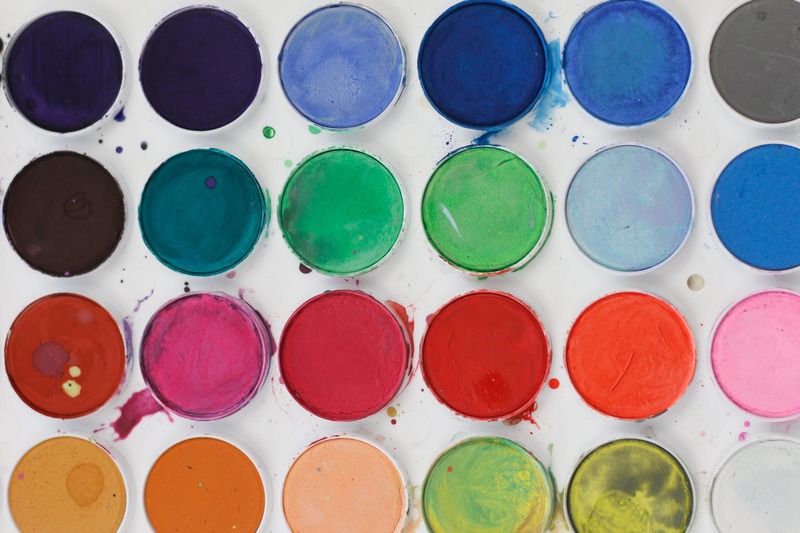 Artists use different kinds of paints depending on the preferred outcome. Some of these include poster color, watercolor, and gouache. This is a type of paint that is designed to be opaque. It also dries on a flat finish; hence it is commonly referred to as opaque watercolor. This paint is manufactured with high concentrations of large pigments and has additives such as titanium dioxide and chalk, which makes it opaque. Gouache may be preferred by artists due to the ability to paint on more diverse colored surfaces and also the ability to paint over darker colors. It also has a flat finish which makes it ideal for solid shapes and lifts with ease due to its large pigments. 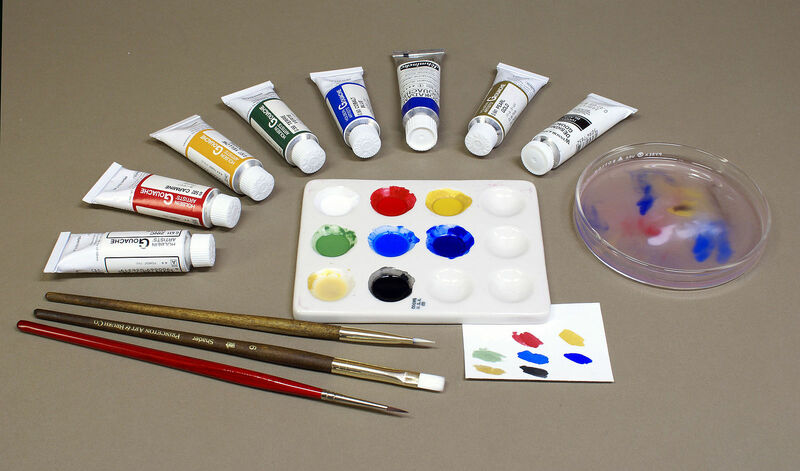 As per an artist’s preference, gouache may either be used dependently or mixed with other watercolor paints. Watercolor is mainly used in cases where an artist wishes to build up many different layers of color. It is also preferred because of its transparency as well as its ability to properly form delicate washes. It also has fine pigments that spread evenly over the painting surface. The transparency can, however, limit how the watercolors can be used. For instance, light colors may not cover the surface well as they are not opaque enough, hence must be used before the darker colors. Both paints are intermixable- This means that watercolor can be used with gouache and at the same time, gouache can be mixed with watercolor to achieve the desired color. While gouache is opaque to semi-transparent, watercolor is transparent to semi-transparent. Gouache has large particles. On the other hand, watercolor has small particles. While gouache is best used for both watercolor and colored paper, watercolor is best used for watercolor paper. Gouache gives best results when used in flat shapes, dark paper, and colorful surfaces. On the other hand, watercolor is best when used in delicate surfaces, for layering and nature surfaces. Every artist has different expectations of the outcome. This is determined by the paint used, and how it is used. For a flat and colorful finish, gouache is ideal. However, watercolor may still be used but it would require a stronger skill set to achieve the same result. As the world is adopting art and appreciating different skill sets, we should continue encouraging more artists to follow their passion. Tabitha Njogu. 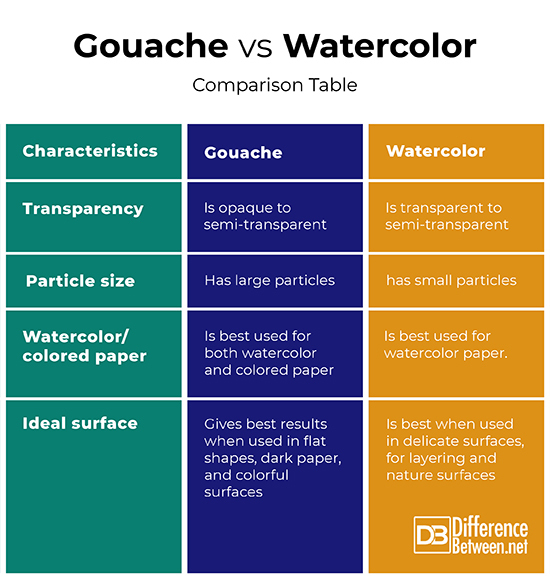 "Difference Between Gouache and Watercolor." DifferenceBetween.net. March 5, 2019 < http://www.differencebetween.net/object/difference-between-gouache-and-watercolor/ >.